Chesterland Historical Foundation – At the corner of Caves and Mayfield Road in Chesterland, Ohio. At the corner of Caves and Mayfield Road in Chesterland, Ohio. The Chesterland Historical Foundation began with a donation of five acres of land at the corner of Caves and Mayfield Roads by Mrs. Stockton, daughter of Walter White, a Cleveland industrialist. 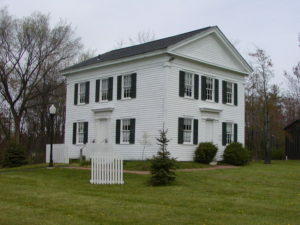 The White’s had a home in Chester, now on the site of Hawken School, and she decided that some of the historical flavor of the township should be preserved so, in 1973, she donated the acreage, on which stood the 1847 Scotland School, with the stipulation that the land be used to preserve and display the history of the township. Over the next three decades the foundation obtained and restored five major structures, in addition to several smaller ones, all retaining the historical features present when they were originally constructed. The Chester Town Hall. Originally built in 1850 and situated at the corner of Sherman and Chillicothe Roads, it was moved to it’s present location in 1981. Today, it serves as the foundation’s focal point with their monthly and annual meetings held in its large open room. Silas Tanner House. Built in 1842 at the corner of Mayfield and Buckeye Roads, it was moved to its present location on June 1, 1987. Much of this home retains its original historical look, with a section of the upper hall framed to reveal it’s original construction…and even some original wallpaper! Stone Family Barn. Donated to the foundation many years ago, it was partially restored when reconstructed on the site. A look at the interior reveals it’s original post and beam construction. 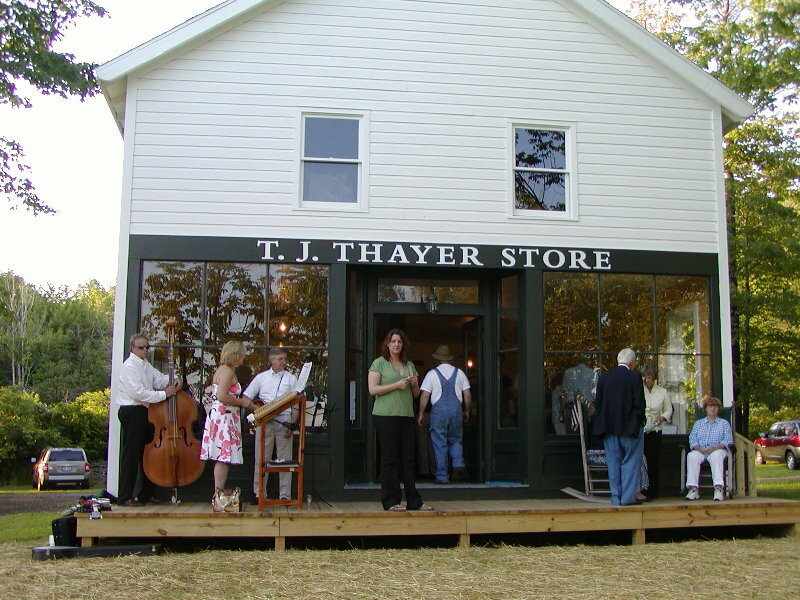 T.J. Thayer General Store. Originally situated next to what is today Bloom Brothers on Mayfield Road, it was moved to its current location in the late 1990s, with restoration completed in 2009. 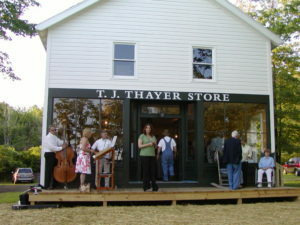 The store was built for T.J. Thayer, a local merchant who had stores in other locations, one of which was at Mulberry Corners. He ran the store for several years and after a succession of owners, it became known as Scotland Store. Upon its donation to the foundation and its move, the name was changed back to what it was originally known as. The interior features a layout very similar to what it would have looked like in 1899, the year the store opened. Scotland School. 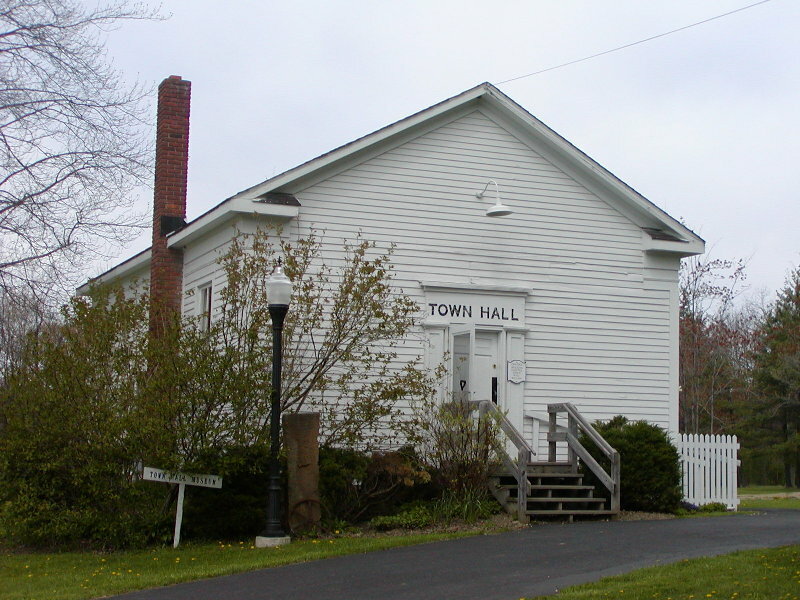 Originally built in 1847, it was used as a one-room schoolhouse until 1926 when it closed. Used later for farm tractor storage until 1975 when restoration of the building began. Today, the school looks much as it did in the 19th century, when it was known as District School #2. Interurban Station. Beginning about 1899, Geauga County was serviced by electric rail from eastern Cuyahoga County. The service ran through Chester and actually crossed the rear of the village site. The interurban station was moved to its current location on April 22, 1987 and a little later, a section of track was laid to enhance the site. The village also has a small woodshed and outhouse, located behind the schoolhouse, in much the same location as the originals. In addition, another outhouse, originally located at the entrance to the Chester Caves Resort, was moved to behind the Tanner house in 2008, complementing the home. 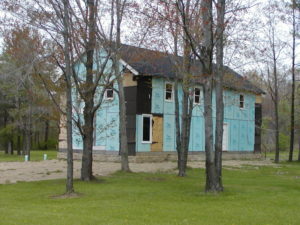 Help us with the restoration of our on-site barn by purchasing a barn bond. Work has started but we need your help to get the job done. Your tax deductible donation, in the form of a bond, will go towards paying for the work needed to rebuild a piece of Chesterland’s history. And, you’ll receive a small gift as a token of our appreciation! More information about the bonds and their purchase can be found here. Situated at the front of the 1842 Tanner house, the walkway is lined with bricks inscribed with names and messages from folks who’ve chosen to support the Village by purchasing a memorial brick. You are cordially invited to join the growing number of people who’ve chosen to support us by purchasing an inscribed brick for $40. For more information about the program, click here. Here are a few pictures of the Scotland Store, taken as restoration of the late 19th century general store progressed. If you’d like more detail, click here. The 1899 General Store as it looked in the spring of 2006. Here it is on opening day, June 16, 2008. 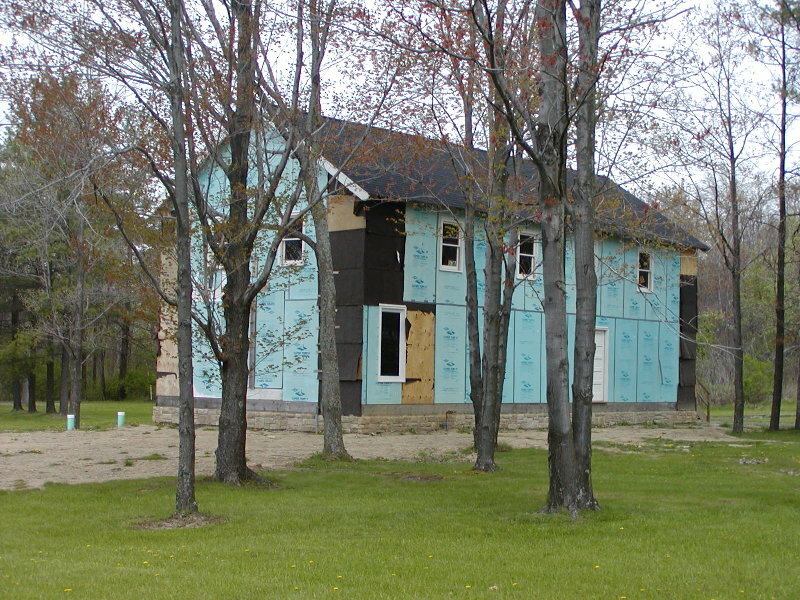 The exterior is complete and the interior is nearly so. All that remained was to do some landscaping! is seeking donations of period items to display in the store. Contact the webmaster if you’d like more information about donations! The 1850 Old Town Hall, moved from the corner of Sherman and Chillicothe Roads. The 1842 Silas Tanner house, relocated from the corner of Buckeye and Mayfield Roads. 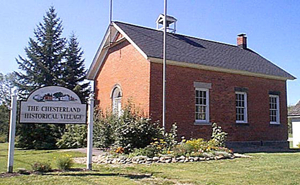 …to participate in keeping history alive by joining the Chesterland Historical Foundation. Tours available for civic, school and non-profit groups. Contact the Chesterland Historical Village for more information.